New Years day, for us, was a lazy affair. Having gone to bed around 6:30am, we slept as late as we could - heat, city noise, and interest in making the most of the last day limited our sleep until about noon. That's not to say we hit the ground running: packing, blogging, and one last brunch with our hosts and their other houseguests were a priority. About 6pm we arrived at the beachside neighborhood of Leblon. It seemed like a good choice for our last day, a little more remote than Copacabana or Ipanema beach, fewer people, a chance at some last-minute shopping and a vegetarian restaurant that had been closed all week and might - MIGHT - be open. Leblon is slightly ritzier and glitzier than the other beach neighborhoods. One change is coming though that will make it accessible to more people: the underground metro line is being extended through Leblon. It's actually the only obvious sign we saw of World Cup / Olympics-related preparations. They are probably frantically constructing things, but we didn't see it. Having taken a dip in the Amazon River, diving in Arraial do Cabo, and wading last night leading up to the fireworks, this was my chance for a proper swim in the Atlantic. The water was lukewarm and the waves were perfect - not as intense as in Sydney on New Years Day last year. Armed with a coconut and a straw, it couldn't get much better than this. One thing we noticed in Brazil - in Rio, Manaus/Amazonas, and Arraial do Cabo - is the ubiquity of 1950s-era Volkswagens. Yes there are a lot of old Beetles, but there are A TON of kombis/microbuses - A TON! Apparently Brazil is the only country where VW still manufactures the vans - but after 63 years it seems they are about to call it quits at the end of 2013. Most of the kombis we saw are used in a rideshare service that is a hybrid of a taxi, a bus, and hitchhiking. It seems to follow a fairly set route, comes more often than the bus, is run by independent "gypsy" operators, and sometimes doesn't even charge at all. We rode one on our way back from the jungle to Manaus. They made several stops picking up and dropping off people who stood on the edge of the street. I didn't see any money change hands, and often not a word was said. 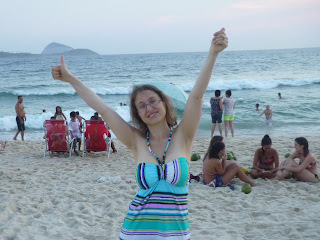 Hooray for New Years Day in Rio! Love the beach pics. In the one of Dave, the mountain in the background seems to be mimicking his hat.